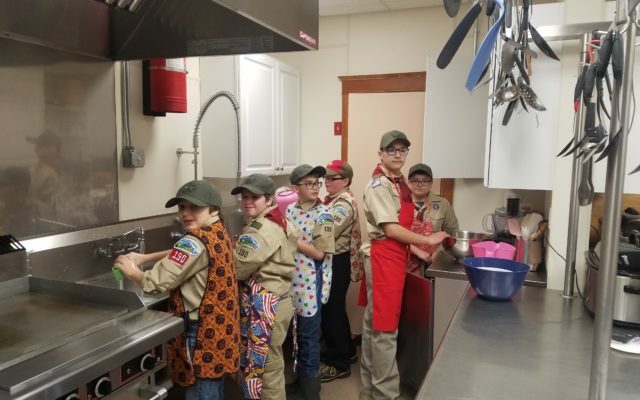 The American Legion Riders of Post 147 group rallied together on Jan. 12 to put on a bean dinner to help the Madawaska Boy Scout Troop 190 raise funds to go camping and purchase other needed supplies. MADAWASKA, Maine — The American Legion Riders of Post 147 group rallied together on Jan. 12 to put on a bean dinner to help the Madawaska Boy Scout Troop 190 raise funds to go camping and purchase other needed supplies. The Legion Riders sold tickets to the general public and all the proceeds went to the local troop Thursday evening. American Legion Riders Director Jenn Collin said that doing events for and supporting groups like the Scouts in the community is important to the organization. “The money raised will allow the young boys in our community to take trips to go camping and to buy supplies so that they can learn and do activities that are not always available at home,” Collin said. Any of the leftover food was donated to the food pantry.